Bring on the Black Bean Enchilada Quinoa- I’m not shy about my love of quinoa..this little nutritional rockstar (high in protein, promotes healthy blood sugar levels, good for your heart etc.- read more about the nutritional benefits of quinoa here) makes its way into so many things I make . The subtle nutty taste of quinoa is a great canvas for so many things! 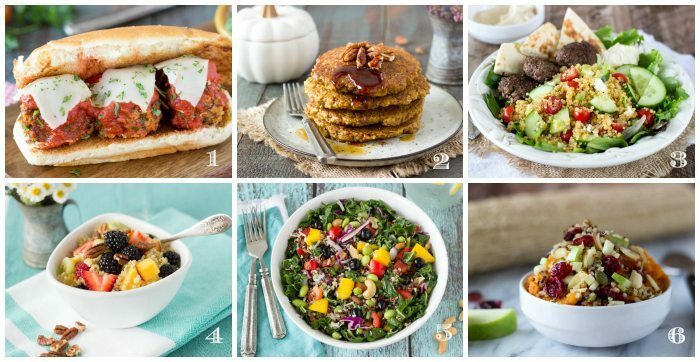 (links below to other quinoa recipes). 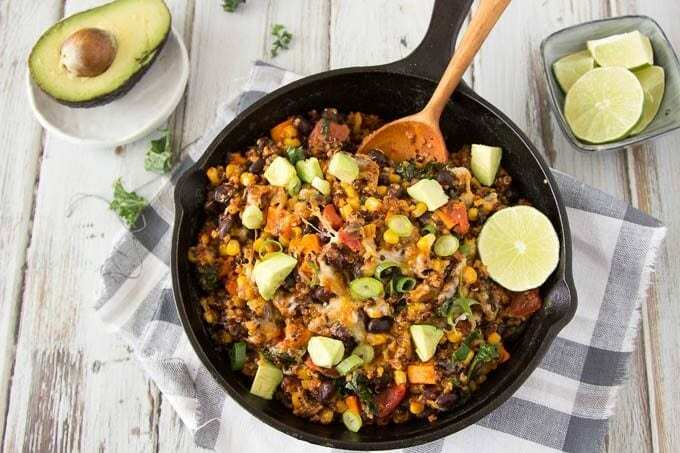 Today for “One Pot Wednesday” (a new super simple one pot recipe coming your way every Wed.) quinoa is shaking it up Mexican style in this Black Bean Enchilada Quinoa. Love enchiladas? (me too!) good, because that’s what we have going on today. Well, kind of. The taste is 100% enchiladas, all that savory enchilada sauce goodness but none of the hassle of actually preparing the enchiladas. No rolling the tortillas, no baking, none of that mess. You see quinoa steps in and takes the place of the tortillas( I promise you wont even miss them). Literally we are putting everything in one skillet (or pot, or dutch-oven) and cooking on the stove-top for about 20 min. 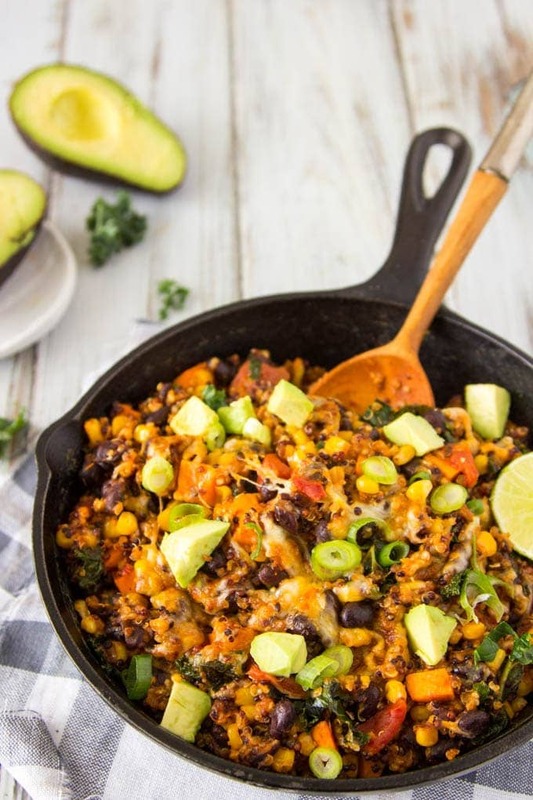 and boom!…just like that enchilada quinoa! 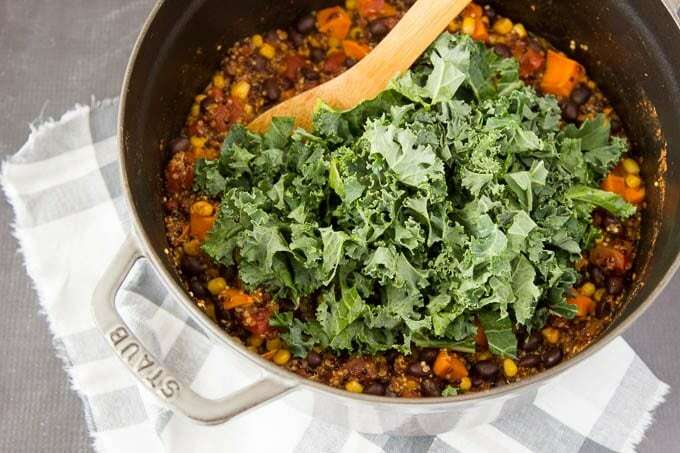 It’s a complete meal (protein, veggies, carbs) the whole family will enjoy. Or, if you’re like me and doing the single thing..it just means you’re going to have a few healthy meals at the ready ( or freeze for a later time). 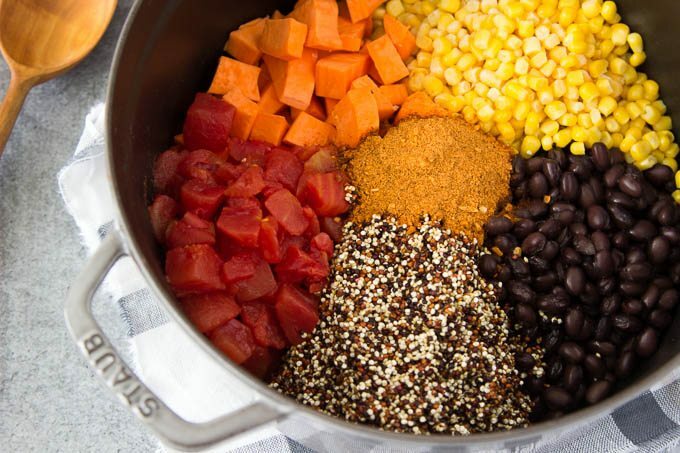 Quinoa, black beans, tomatoes, corn, diced sweet potato, and taco seasoning all go into the pot…. 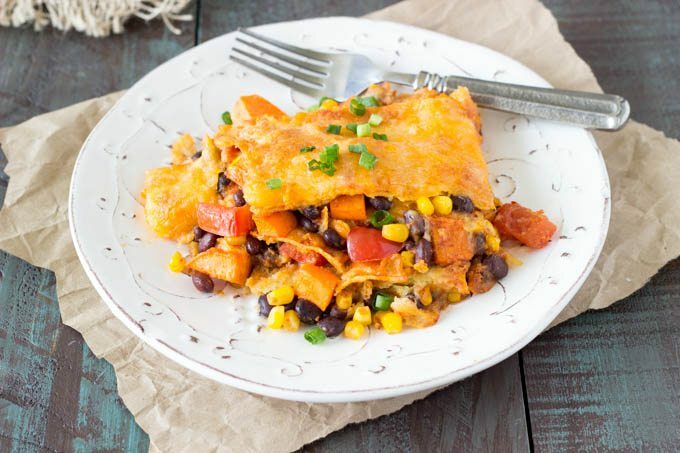 and the cheese (if using) …..
ta dah!…Quick + Easy Black Bean Enchilada Quinoa! 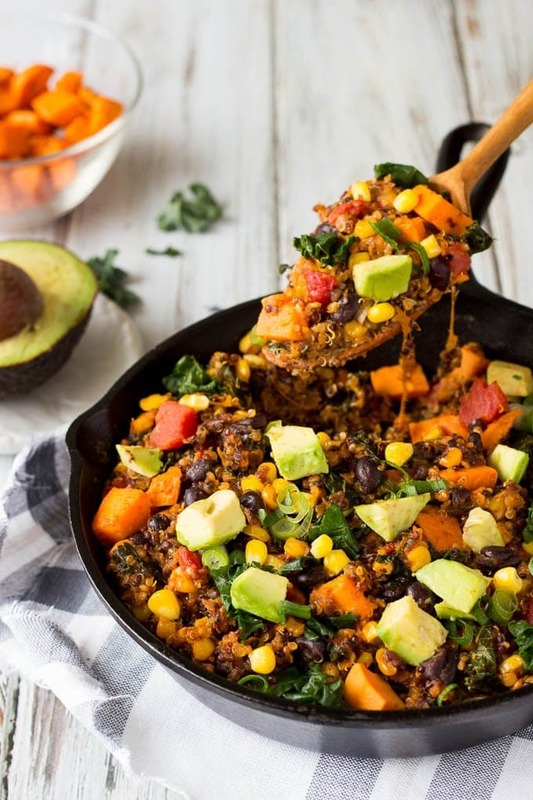 In a large skillet (or dutch oven) combine rinsed quinoa, black beans, sweet potato, corn, tomatoes, seasoning, enchilada sauce and ½ cup of water. 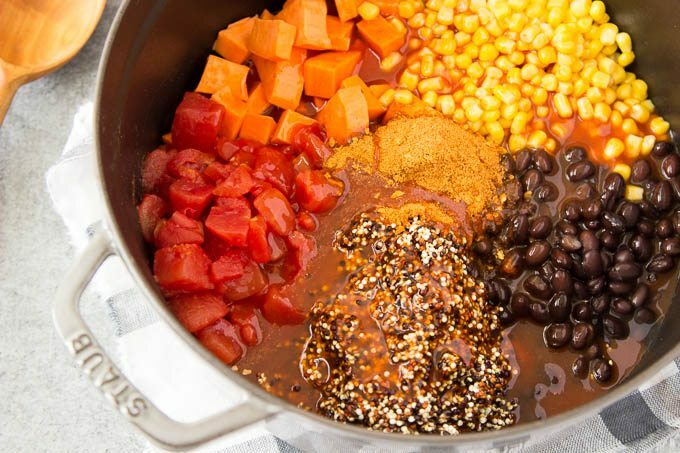 Bring to a boil, cover, reduce heat and simmer until quinoa is done (about 15-20 min.) stirring occasionally. If necessary add additional water. 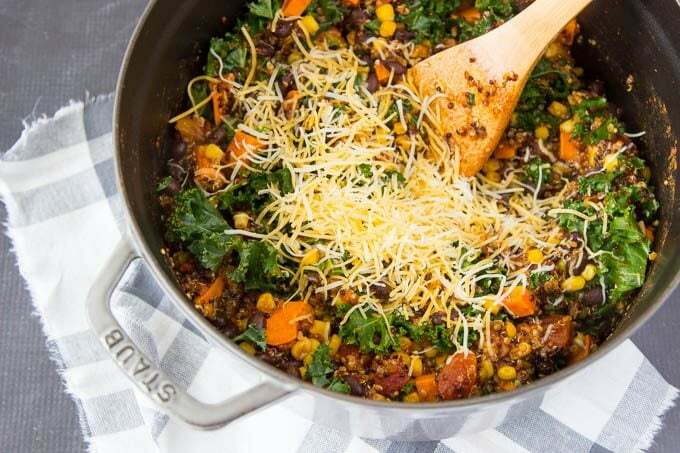 Stir in kale and cheese. Serve with desired toppings. * To make your own taco seasoning : 1 tsp chili powder, 1 tsp cumin, ½ tsp paprika, ¼ tsp garlic powder, ¼ tsp onion powder, ¼ tsp red pepper flakes, salt and pepper to taste. LOVE this recipe! My daughter and I fought over the leftovers. Thanks for sharing. Can’t wait to try more! do you have nutritional content? trying to log everything I eat. Hi Liz- I just updated the post to include nutritional values. Please note they do not include the optional toppings (since what people decide to add will vary widely). I hope you enjoy! This was fantastic. My entire family liked it! Really easy to make and flavorful! Thanks Sherri! I’m glad the whole family like it!